My wife and I went to Penang to attend a relative's wedding during March. I booked a hotel room before our departure to Penang. This hotel is located in George Town, Penang. It's a 4-star hotel. I paid RM 165 for the hotel room. 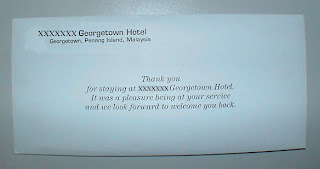 When arriving in Penang, the first thing I did was to check-in hotel. As we were hurrying to look for the wedding location, we didn't brought our luggage to the hotel room. We returned to the hotel after finding the wedding location. We were really disappointed with the hotel room condition. We didn't request for room replacement because we were rushing to attend the wedding dinner. We checked-out the next morning. This hotel is under the management of a transnational corporation. I wouldn't step in any hotel that manages by this transnational corporation in the future. What would be the outcome if a foreigner encountered this sad experience when traveling in Malaysia ? Hi Friends,Very nice blog here.My blog walking with sharing a good information. relatively high Alexa rank and gets around 400-500 pageviews a day.